A professional ballerina turned professional chef, who has just authored a cookbook in which Vanilla is the star! That announcement hit three of my hot buttons - dance, cuisine and my favorite flavour and aroma, vanilla. And as someone who turned to working in the arts after a thirty years in science, I was fascinated to learn about how and why a ballerina of 30 years duration became a chef. So as soon as I read that Natasha MacAller would be in Vancouver for a book signing at Barbara Jo's Books To Cooks store, I knew I wanted to meet her in person. We were scheduled to meet at ten at the Granville Island Hotel's Dockside Restaurant. As per my usual practice I was there a few minutes early. Right on time I observed a petite elegant woman with the posture of a dancer and a warm smile walking towards the restaurant and my first thought was how perfectly she matched the cover of her book, Vanilla Table. Over coffee in a wide ranging conversation I was able to fill in details about facets of her story that had intrigued me as I did my research for the interview. Natasha started ballet when she was 6 years old and began professional training at 13 years. She enjoyed a 30 year career dancing with the Joffrey Ballet in New York, the Boston Ballet and finished her dance career, dancing and singing in the Broadway and Los Angeles productions of The Phantom of the Opera. Her parents were both singers so singing was also part of her life from an early age. I had not realized that most dance companies have a three or four month lay-off period annually. During her dance career Natasha used this time off to train and develop as a professional chef. She completed an 18 month intensive training at the Colorado Culinary Institute, finishing first in her class. For eight years she owned and operated Dancing Chef Catering, a company that catered for TV, theatre, film and "foodie" functions. As one of the apprentice chefs for the USA Team California in the 1996 Berlin Culinary Olympics she created an ahi tuna appetizer that won a gold medal. Together with her colleague, Anne Conness, in August she will be opening a restaurant called Sausal near the Los Angeles Airport, featuring Nuevo Rancho Cuisine. She explained that this meant that the food style would be influenced by a mix of Spanish, Mexican and other North and South American cuisines. The fragrance of vanilla has delighted Natasha since her childhood when her mom used to spritz her with vanilla-scented cologne before ballet class. But she was inspired to create her cookbook on a visit to the Heilala plantation, an organic, fair-trade, family business in the Kingdom of Tonga. 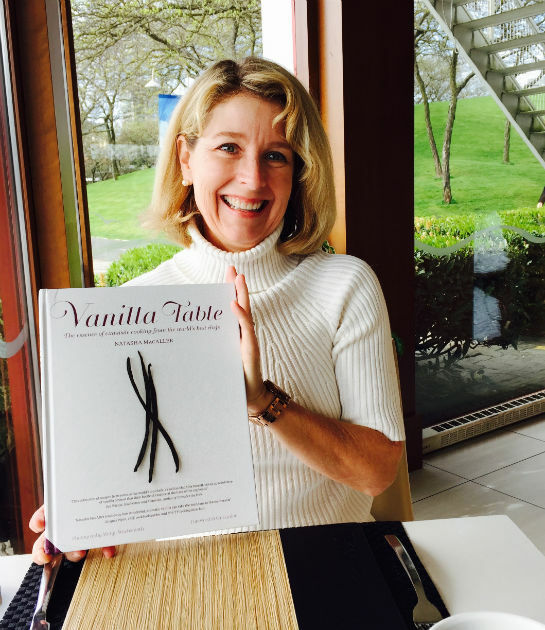 There at the First International Vanilla Food and Wine Event, she and New Zealand chef Peter Gordon (who wrote the foreword for the book and contributed a seared scallop recipe), created, cooked and served a range of vanilla dishes. Part of the proceeds of her book will be donated to the Heilala Vanilla Foundation. As well as her own recipes, the book includes delicious recipes from a select group of international chefs. After 30 years in which dancing as a professional ballerina was a major focus of her life, I asked her what role dance played in her current life. I shared with her the story of how it was my desire to be able to get out onto a ballroom dance floor again that drove my rehabilitation from emergency back surgery so that now I can move and dance without pain. And she shared with me the story of fracturing her spine, in the second week of a dance contract with the Royal Ballet of Flanders in Antwerp, Belgium. Told that she would not be able to dance again and may not walk, it was her passion for dance and determination to dance again that got her through so that she could continue on to have her fulfilling ballet career. When we had finished our coffee and exhausted my list of questions we walked down to the Granville Island market, stopping on the way at a fishmonger shop that sells a delicious sable fish candy. After I pointed out a few of my favorite stalls for charcuterie, breads, cheeses, we parted company. With my packages of sable fish candy, charcuterie, and strawberries bursting with flavour, I headed off to catch the ferry across False Creek, inspired by the warmth, energy and passion for life of this multi-talented Dancing Chef, and ready to cook.